Summary of presentation by Marcus Gregson, Dept of Fisheries (part of NSW Dept of Industry & Investment), 21st September 2009, at Forum general meeting. 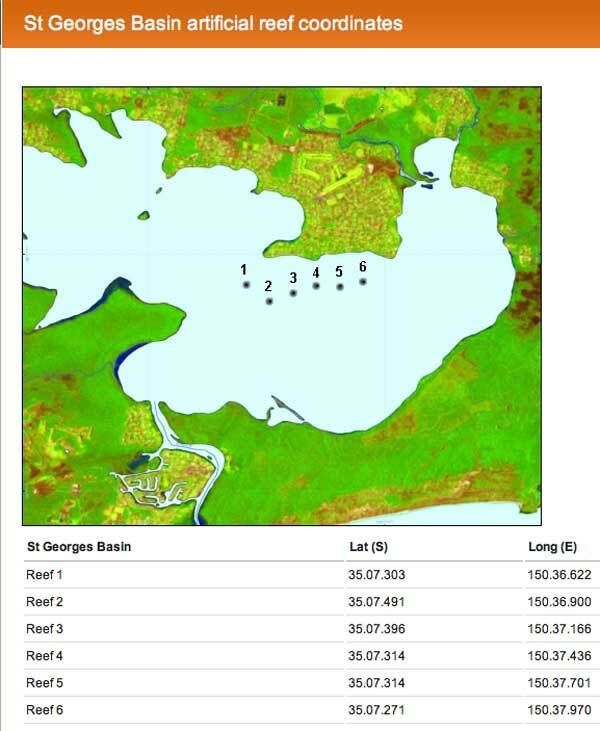 In February 2007, 180 reef balls (6 individual reefs) were placed in St Georges Basin. The reef balls are constructed of hollow cement balls, with holes all the way through for fish access. The Ph of the cement is matched to marine environment. Artificial reefs are no longer constructed with used tyres; deliberatly-sunken ships are also now not so favoured. The reefs in the Basin are monitored by baited underwater video; i.e. a camera lowered with bait attached, for periods of half an hour at a time, to record species & numbers. Diver surveys are also used. 3rd monitoring method used is photographic survey. Levels of algae & encrusting invertebrates are also measured. St Georges Basin has very limited visibility, which is reduced even further after rainfall events. There are 2 types of fish: ‘gregarious’ & other – fish that only ever live inside the balls. 13 species have currently been noted. Of 6 sample species 5 of them preferred artificial reefs. The reason for this preference for artificial reef over natural, is yet to be ascertained. Mudcrabs like to live inside the balls. Sharks do NOT live in the Basin. Photographic survey revealed presence in St Georges Basin, of a large number of key species targetted by recreation fishers. The St Georges Basin project has been working well for approx 2 years. The plan is now to expand the project - larger reefs, and build up more species of larger fish. There will be an additional 420 extra reef balls placed, resulting in a total of 600. The additional 420 reef balls will be the next two sizes larger than first sizes. The deployment schedules starts early 2010. Stereo video monitoring is another method to be used. This method assists in measuring the sizes of the individual fish. This project is being funded from recreation fishing trust, primarily to increase the ‘fishing experience’ of recreational fishers. The reefs also provide habitat for juvenile & bait fish. These reefs are only created in places where professional fishers are banned. Do fishers ever encourage other species into an area; would they deliberately introduce species? Answer: the department is currently doing an assessment on stocking of marine fish. e.g. Bream, Snapper, and Kingfish. Has started with prawn stocking. Other lakes & dams have had prawn stocking stopped. Answer: Numbfish in Lake Macquarie. Amberjack & Kingfish. Is snagging of lines, hooks, & sinkers a problem? Answer: Generally not. There has been an occasional anchor caught. What’s the limit of depth for effectiveness? Answer: 5 - 6 metres is ideal, the sand being coarse enough, and deep enough to be out the way of boating traffic. Shallower than 5, or deeper than 7 would encounter anoxic mud. Depth is also dictated by size of reef ball. If placed too deep, small balls would not be effective. Large balls placed on unsuitable sediment would sink. Has fisheries department supervised any netting in the Basin in the past few months? Answer: Researchers were here approx 3 months ago, and do use netting for research data. Mesh nets & beam-trawl nets are deployed, and the ‘catch’ does not go to market. Mr Douglass Rotherim had been booked to attend this Basin Villages Forum meeting to answer this, but gave apologies due to illness. Maximum 100 specimens per species may be collected for research, to ascertain if cessation of commercial fishing has allowed species recovery. Mr Rotherim will present details at this at a future Forum meeting. Has caulerpa taxifolia ever been found on balls? Answer: No, their placement is far too deep for this weed. What % of fishers violate bag limits? Answer: there is generally 80% compliance. Fish auctioned after fishing competitions? - proceeds must be donated to registered charity. 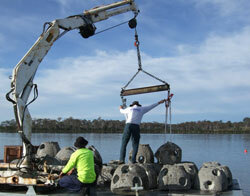 Click here to view the NSW Department of Primary Industries webpage on artificial reefs in St Georges Basin. Video footage of the artificial reefs can be viewed on Youtube. Go to Youtube, and do a Search for “St Georges Basin artificial reefs”.